← Webelos Fun Day — 2012! The fall Court of Honor will be on Thursday October 18 at 6:30 (pm) at the Old Fire Station. If you can, please come a few minutes early. 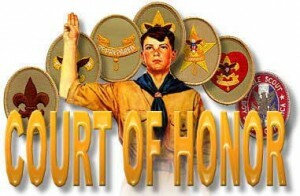 For those who don’t know, a Court of honor is a ceremony for those who earned merit badges and rank awards since the last Court of Honor (March 29, 2012). Scouts should invite their parents, grandparents, friends, and anybody who would be interested. Please come in your full uniform (includes sash if you have one).